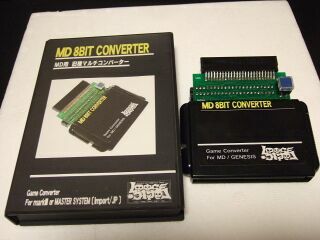 The MD 8-bit Converter is a Sega Mega Drive accessory produced for Japan by Loose Logic in 2004. It is essentially a smaller Power Base Converter, allowing Japanese Sega Mega Drives to play Sega Master System games of all regions. The device is very flimsy, so much so that the PCB is always visible. Connected to the PCB at the top is a NTSC-U/PAL cartridge slot, while on the back is a NTSC-J cartridge slot. The device otherwise works in the same way the Power Base Converter does. The box design is also based on the styles used with SG-1000 cartridge-based games. Running the European release of OutRun Europa. Running a Sega Mark III game. As you can see there may be balancing issues. Running the western card release of Transbot through the Japanese Sega Card Catcher.